...But it's even more important to get to the source of the problem: The criminal miners themselves. By selling ORE equipment, our Agents make money and find new targets, like pps Chelien. Agent Ernst Steinitz quickly hunted down the miner who purchased his ORE Ice Harvester. And I do mean quickly. Look at the timestamps. From the sale of the module to the gank of the miner, only 24 minutes elapsed. 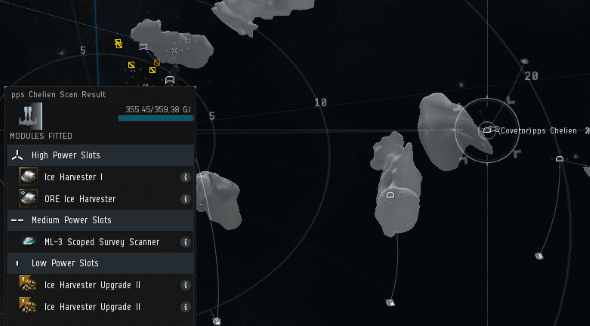 Miners, when you purchase ORE modules, you might be buying yourself a gank. Not everyone in local chat appreciated this gloriously efficient victory. As the local scoffer noted, the ORE Ice Harvester did not drop this time. That's how we remove the modules from the economy. The Loot Fairy decides how many miners must die first. Agent Ernst eventually got pss Chelien into a private chat. The miner immediately proclaimed himself a newbie and demanded reimbursement of his lost contraband. I wonder where he got the idea that EVE works that way. When a Goon fleet kills a titan, does the titan pilot ask those Goons to give him a replacement titan? Somehow, pps Chelien knew to play up his newbie status. He implied that the destruction of ORE Ice Harvesters hurts player retention. 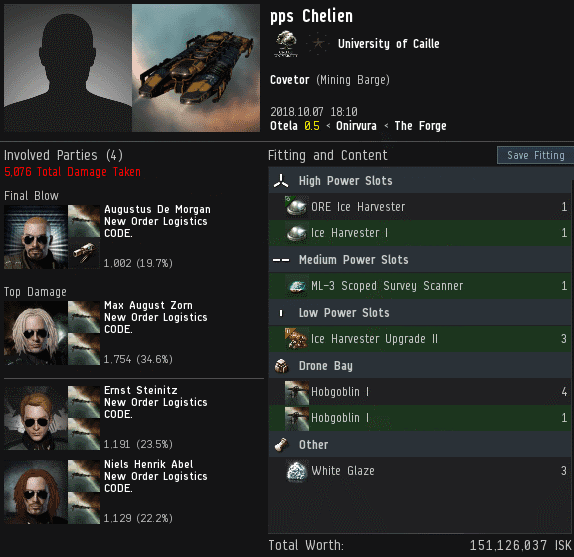 Despite being a newbie, the miner managed to scrape together 169 million isk for an unnecessarily blingy module. That reminds me of all those carebears who say that when a 10 billion isk jump freighter gets ganked, it makes newbies leave the game. Naturally, the guy who can spend 169 million isk on an ice harvester can't afford 10 million for a mining permit. pps Chelien did further damage to his cause by trying to scam an honest Agent. Tsk. It's a strange phenomenon--players who barely know how to fit their ships, yet they already have all the carebear talking points down pat. Has anyone run the EVE tutorial lately? I'm starting to wonder if it teaches them to do this. Ernst helpfully provided pps Chelien with actual information to burst all the myths that the miner had absorbed. The miner wasn't interested in ghosts, though. Protip for all you carebears out there: Our Agents don't play EVE with their eyes closed. That's one of the reasons they win all their battles against you. The novice knife hand left the convo and retreated into the darkness, only to be ganked by another Agent the next day. No doubt he complained that he hadn't been warned. But at least he bought cheaper modules. You throw your newbie card out the window when you fit the blingy ORE module. Also when you're more than 30 days old (D.O.B. 17.Aug.2018) and when you leave your rookie system. This is EVE. Carebears are born to be big pussies, it's in their blood. That is how they have the talking points down even if they are new to a game. Impressive stuff! Keep it up!